Arcades today are much different than those of the 1970s and early ’80s, an era that many experts refer to as the “Golden Age” of video games, a time when such simplistic (but addictive, challenging, and fun) games as Centipede, Defender, Donkey Kong, Ms. Pac-Man, and Galaga captured the public’s hearts, minds, and quarters. These games, with their compelling, twitch-based gameplay, were easy to learn, but tough to master: fast reflexes and laser-focused concentration were absolutely crucial for making your quarter last longer than a few seconds. Depending on the venue, many arcades also had pinball machines, pool tables, and/or other diversions, and loud rock music would frequently reverberate throughout from hidden speakers. Most arcades were darkly lit, and oftentimes people could smoke, giving the hangouts a speakeasy-for-teens type of vibe. 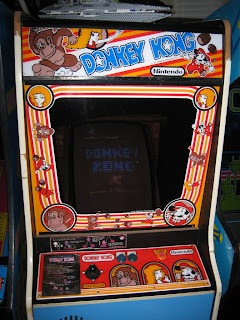 Modern arcades may be cleaner and more family friendly, but Golden Age arcades had more character and atmosphere, not to mention better (if technologically inferior) games. The first commercially released arcade video game was Nolan Bushnell’s Computer Space (1971), a game obviously patterned after Steve Russell’s Space War!, which was one of the earliest digital computer games. The first commercially successful arcade video game was the tennis-like Pong (1972), which was the brainchild of Bushnell, who probably got the idea for the game from Ralph Baer’s Magnavox Odyssey home game console. The Odyssey offered several variations on the type of video tennis formula pioneered by Baer, but popularized by Pong. 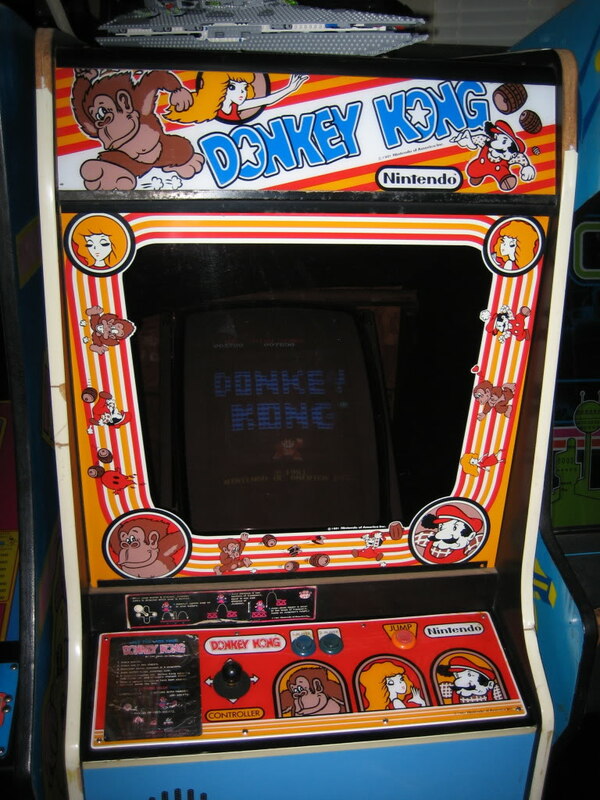 A variety of historically important arcade video games followed in the wake of Pong, including Atari’s Space Race (1973), Kee Games’ Tank (1974), Bally/Midway’s Gun Fight (1975), Atari’s Breakout (1976), and Exidy’s Circus (1977). However, it wasn’t until the 1978 release of Space Invaders that the industry truly took off. Produced by Japanese developer Taito, Space Invaders, which was the first shooter of its type (it created the “slide-and-shoot” subgenre), was licensed by Bally/Midway for distribution in the United States. The game was such a sensation in Japan that it caused a nationwide shortage of the 100-yen coin used to play the game. In America, more than 60,000 Space Invaders cabinets were sold during its first year in production. It was the chief catalyst of the video game craze of the era, in which thousands of arcades popped up all over the country. 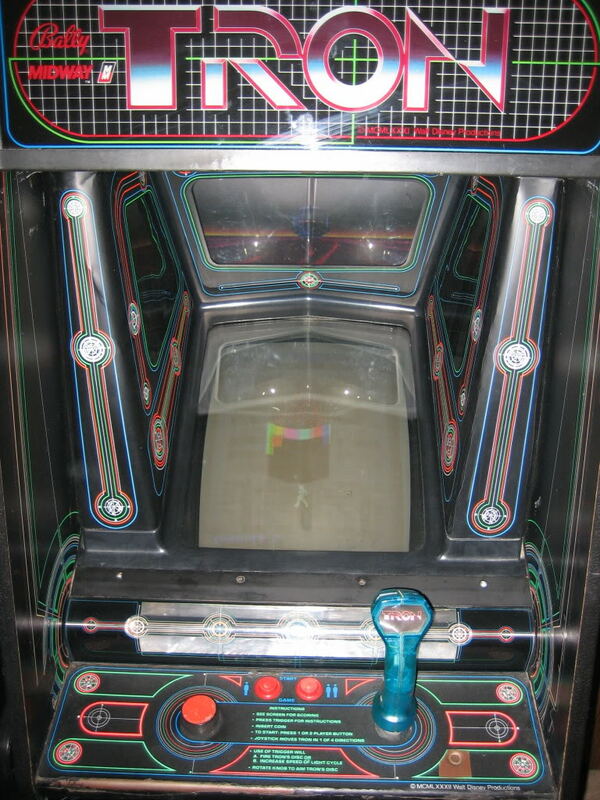 In addition to arcades, coin-op games began showing up in a variety of unconventional establishments, from Laundromats to supermarkets to convenience stores to the lobbies of pro sports venues. 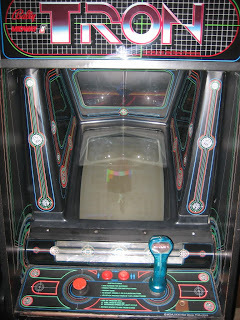 Numerous chart-busting arcade games followed, including such famous titles as Atari’s Asteroids (1979), Stern’s Berzerk (1980), Nintendo’s Donkey Kong (1981), Sega’s Turbo (1982), and Cinematronics’ Dragon’s Lair (1983). 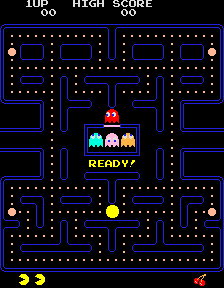 And, of course, there was a little game called Pac-Man (1980), which unleashed an avalanche of imitators (including Lady Bug and Mouse Trap), sequels (including Ms. Pac-Man, Super Pac-Man, and Jr. Pac-Man), and merchandising, including lunchboxes, cereal, canned pasta, plush toys, sneakers, candy, and trading cards. Not content to simply wax nostalgic about the arcades of his youth, Sulfridge has tried with some measure of success to simulate the experience in his home by outfitting his game room with coin-op classics. In addition to a modern pinball machine (South Park), Sulfridge has the following vintage arcade games in his collection: Millipede/Centipede, Warlords, Asteroids, Blasteroids, Galaga, Gauntlet, Sinistar, Ataxx, Tron, Ms. Pac-Man, Moon Patrol, Donkey Kong, Phoenix, Tempest, Mortal Kombat 4, Smash TV, Neo Geo 1-Slot, Joust, and Star Wars. Despite his part tongue-in-cheek, part reality-based misgivings, O’Hara obviously loves owning his favorite video games. And, like Sulfridge, he has fond memories of arcades of the early ’80s. “Arcades were a social gathering place,” Ohara writes, “a secret clubhouse away from adults where kids met and hung out with their friends. There was no feeling quite like being so awesome at a game that a crowd would form around you and watch you play.” Thanks to a converted workshop in his backyard, O’Hara, who regularly has friends over to enjoy his arcade, can experience that feeling once again. A few commercial arcades still exist that cater to retro gamers, such as New Hampshire’s Funspot (www.funspotnh.com), which bills itself as “the largest arcade in the world.” However, most arcades these days are filled with modern games that bear little resemblance to their forebears. 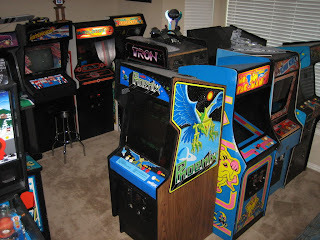 Assuming you have enough space in your home, creating an old-school arcade is difficult, but certainly doable. Auctions, eBay, Craigslist, and other outlets routinely offer coin-op classics for sale. Most working machines from the late ’70s and early ’80s run between $250 to $800, depending on condition, availability, and desirability. If you do plan on creating a home arcade, or you simply want to buy a machine or two to put in your office or game room, just remember this key piece of advice: Have fun! 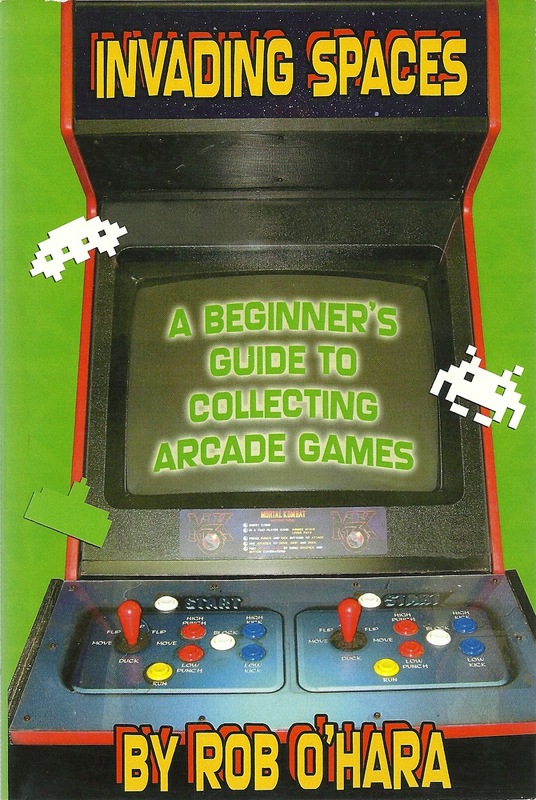 For more info on classic arcade games, check out the following books: The Encyclopedia of Arcade Video Games by Bill Kurtz; The Ultimate History of Video Games by Steven L. Kent; High Score! 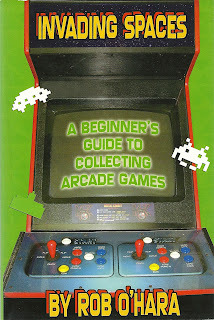 The Illustrated History of Electronic Games by Rusel DeMaria and Johnny L. Wilson; and Supercade: A Visual History of the Videogame Age 1971-1984 by Van Burnham. Nice post. I learn something new and challenging on sites I stumble upon every day. It will always be exciting to read through articles from other writers and use something from their websites. Reading this brought back so many childhood memories! I remember going to the arcade with my little brother, and playing for hours. My personal favorite was Pacman, I got so good at it. It would be so fun to get one for my house now. My kids could become champions like me!